PHOTO COURTESY OF TIFFIN UNIVERSITY Former Tiffin University football coach Gary Goff walks the sidelines in a game last season. Gary Goff got an offer that he couldn’t refuse. The Tiffin University football coach resigned last Friday to take the head coaching job at Valdosta State. It’s not only Goff’s alma mater — he was a wide receiver and captain for the Blazers in the mid-90s — but it’s also the Division II national champions. And so, Goff’s tenure as Tiffin’s coach ended with him taking the division’s best job, eight years after taking what — at the time — was one of the worst. As the primary beat reporter for the Dragons, I got the chance to know the coach pretty well. He always had a sense of humor. One time, during an interview, Goff told me that he wasn’t sure whether his quarterback was going to start that Saturday. But he was grinning and shaking his head ‘no’ as he said it. He believed in things that went beyond football. When he arrived as Tiffin University’s new football coach, he took over a program that had won just twice in three years. But it was actually in worse shape than that. 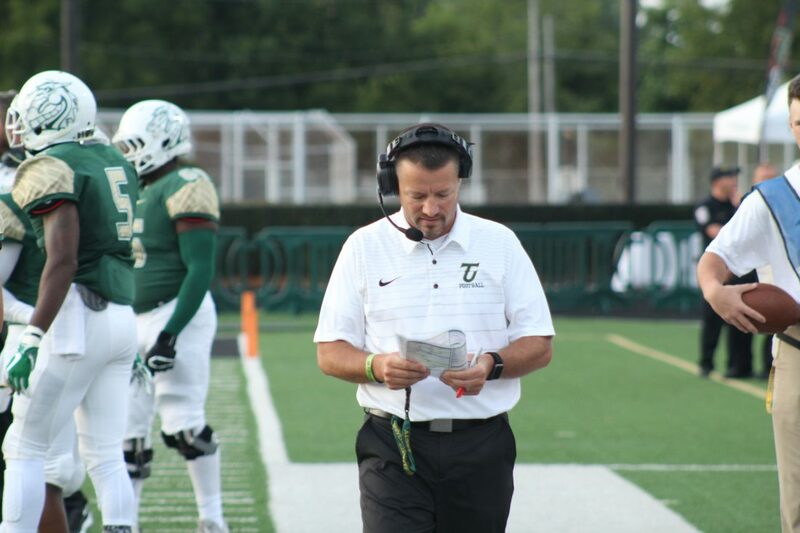 “The first year, he cut, I believe, 38 of our players and started bringing in his own program guys, and developed a staff that had his beliefs, and his backing,” Tiffin Athletic Director Lonny Allen said Saturday. Goff was about football. Be he also wanted — needed, actually — the right type of guys. But what I will remember most about Goff is his toughness. This past year, I called him for an interview about an upcoming game. The coach didn’t call back for some time. When he did, he gave the interview, but sounded exhausted. Only later did I find out he was calling me from a hospital bed. He had an illness that didn’t allow him to attend the game; he had to watch a streaming version from his room. For the next two weeks, a recovering Goff had to watch the game from the media box. Somehow, the Dragons won all three games — all of which were on the road. “You don’t have a choice, you have to find a way to get through it,” he said. Goff was asked, but didn’t directly answer, whether getting through the illness was tougher than his first season. He had patience and he had faith. Enough to endure an 0-11 season in his debut year. At the time, the coach seemed unflappable. But he said that wasn’t the case. In the short version of Goff’s Tiffin tenure, he took a team that was 0-11 and turned it into a nationally-ranked program by the time he left. But it wasn’t like the next few seasons were easy, either. Anyone watching could see the Dragons were getting better. But the results weren’t there. The Dragons went 3-8 in back-to-back seasons, Goff’s second and third. Here, Allen and the Tiffin leadership deserve credit. Every program — from high school to the pros — says it will be patient on a rebuilding project. But few actually follow through. Allen and the TU leadership gave Goff and his staff time to turn things around. A 28-17 win at Saginaw Valley State. It was not only Goff’s first Great Lakes Intercollegiate Athletic Conference win, but it was a road victory against a team that was ranked in the top 25. The coach didn’t try to hide the jubilation that came after the victory. When I called him for postgame comments, he didn’t even say hello. With the benefit of hindsight, it was the turning point. Pipkin threw for 229 yards and a touchdown that night. But he also had help from tailback Jerry Brown, a McComb graduate who went for 75 yards and a score. And receiver Jalen Santoro — a star quarterback at Bellevue who a year prior had led the Redmen to a state final appearance — also saw the field. It was part of something that Goff had focused on: recruiting in this region. Goff always had players from this area on the roster, whether it was Carey receiver Gavin Woods or Columbian quarterback Todd Simonds. He also brought in former Columbian coach, Hall of Famer Steve Gilbert, as an assistant. Goff said the impact of having a regional outlook goes beyond the field. The Dragons went 10-12 over the 2014-15 seasons. But real success was coming. With Pipkin, receiver Charles Holland and running backs JaQuan Hardy and Kyle Brunson pacing the offense, and defenders like Daijohn Isbell and Jacob Williams, Tiffin has had three straight winning seasons. It went 9-2 this past year, with quarterback Nick Watson stepping into a primary role. Goff said that recently, Brown told him he was glad he wasn’t playing football anymore. The coach was stunned. Brown was — after all — one of his favorite players. He asked why. “He said, ‘Because, I could never play over JaQuan (Hardy) and Kyle Brunson,'” Goff recalled. The 2019 Dragons will have new leadership. Duerr, who returned to the program as an assistant last month after five seasons as the head coach at Beloit College, was named interim coach. Duerr said he has two goals in his new position. One has to do with recruiting. “We’ve had some really talented young men commit already, but obviously when this happens, there’s a shakeup that leaves doubt in some kids and some families’ minds,” he said. “And (we) just try to let them know that, ‘look, nothing’s gonna change. The program’s in great shape, and there’s a really solid staff here that’s continuing to do the work in the right way and there’s a great team here. Last week, Allen said there would be a thorough, national search. But he also didn’t rule out that the new coach could be an internal selection. Duerr said he’d like to be considered for the permanent coaching job. Maybe that’s Goff’s greatest accomplishment: Turning the program into a destination point. That’s the mark Goff has left. Zach Baker is the sports editor at The Advertiser-Tribune.